The CCP has long infiltrated the United States and influenced America's policy on China — a phenomenon that the Trump administration has recognized. Businesses and investors in China need to recognize the shift in Sino-U.S. relations from engagement to competition to avoid potential political risks. We were the first to analyze that the U.S. would put ZTE on “probation” instead of passing an outright ban due to national security considerations. We analyzed that the U.S. will step up sanctions and go after China on human rights issues if the CCP does not reform its unfair trade practices. We were among the earliest to observe that the U.S. had changed its China policy from engagement to competition. We analyzed that the U.S. is seeking to reshape the CCP-hijacked world order. The CCP is misreading America’s China policy revolution. China cannot withstand an 'unavoidable' Sino-U.S. trade war. China cannot withstand a trade war. Beijing would end up making concessions under the guise of “reform and opening up.” Concessions, however, don’t necessarily mean an end to Sino-U.S. trade tensions. A trade war seems unavoidable, particularly with President Donald Trump labeling China a “competitor” in his National Security Strategy. Trump is likely engaged in a strategic chess game with China. He will likely continue to be friendly with Xi while attacking China. 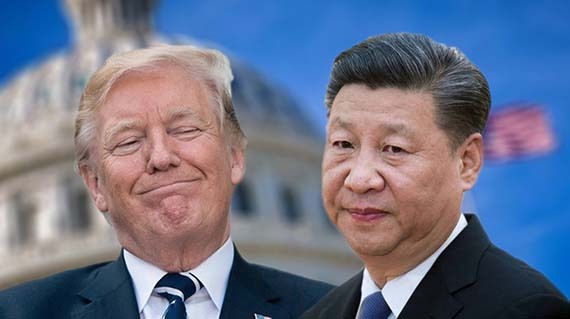 What we said Trump’s different treatment of Xi Jinping and China following their meeting in April suggests that he is playing a strategic chess match and aiming for an endgame that could potentially surpass Ronald Reagan’s most significant foreign policy accomplishment. President Donald Trump signs a presidential memorandum related to a related to the Section 301 investigation of China’s trade practices and intellectual property theft. Over the following months, China’s stock market plummets and the renminbi devalues sharply. If China tries to source soybeans from other countries, its acquisition costs will inevitably go up. Meanwhile, other countries would naturally resolve their soybean shortfall by buying American. Put another way, China’s soybean retaliatory measures will have minimal impact on the U.S.
Can China Withstand a Trade War? Should the CCP decide to go “all the way” against America, it faces a tsunami of problems that could lead to regime collapse. Chinese exports would be hit hard, foreign investment would withdraw from the mainland, the manufacturing sector would go under, and unemployment would skyrocket, and Beijing’s fiscal deficit would be even more severe. As China’s foreign exchange earning capacity decreases, its foreign-exchange reserves would be reduced. And if the RMB exchange rate doesn’t have foreign exchange support, the yuan would depreciate and capital outflow would expedite. To repay foreign debt, Beijing would have to keep printing money, and banks would increase interest rates when confidence in the RMB falls. 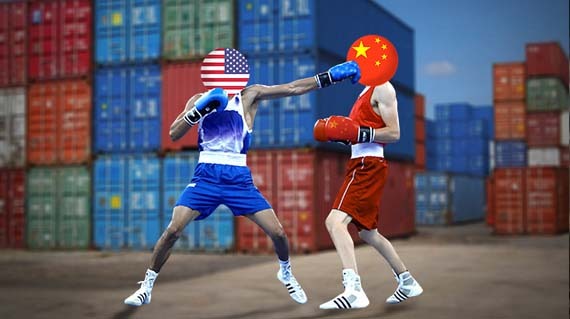 What we said In sum, we believe that China cannot withstand the impact of a full-blown Sino-U.S. trade war because it is already running a high fiscal deficit. In a presentation at the National Press Club, U.S. Commerce Secretary Wilbur Ross noted that a trade war with China would at worst impact "one-quarter of 1 percent of our economy." "We need to meet the people's growing needs for a better life," said a staff at China's Customs Tariff Commission when asked about why the State Council was lowering auto tariffs. President Donald Trump announced the first wave of tariffs on Chinese imports. By September 2018, the U.S. had imposed $250 billion worth of tariffs as compared to China’s $60 billion. SinoInsider has correctly identified trends in Sino-U.S. relations since the start of the year. We have been able to accurately read and anticipate developments in Sino-U.S. relations partly because we have a deep understanding of CCP elite politics and its operations. On April 16, the Commerce Department bans U.S. companies from exporting to ZTE for seven years. The Trump administration would remove the business ban on ZTE and instead place it on some form of “probation” due to national security concerns. What we said Washington could put ZTE on “probation” and very stringently monitor its future dealings with the Chinese company. 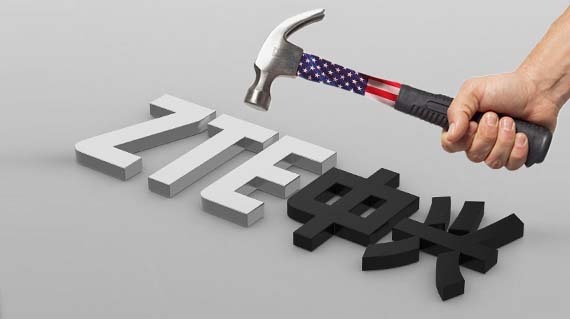 ZTE submits a formal complaint to the U.S. Commerce Department requesting a lifting of sanctions. What we said The new ZTE deal is entirely consistent with Trump’s NSS, and arguably does a better job at preserving America’s long-term national security interests than the previous deal. Indeed, the new deal could later be regarded as an important milestone by the U.S. in advancing national security interests in dealings with China. The U.S. Commerce Department and ZTE reach an agreement to allow the company to resume operations. The White House releases a statement on ZTE which cites U.S. national security interests as a reason for the revision of the business ban. The U.S. Commerce Department lifts the ZTE ban and imposes strict new measures, including installing a compliance team answerable to the Department in ZTE, replacing the company's entire board of directors and senior leadership, and activating a clause that reinstates the original ban if ZTE carries out additional violations in a 10-year period. The trade conflict between China and U.S. will pose problems for Xi Jinping’s reform agenda, and the CCP will cause trouble for the United States. The U.S. will step up sanctions and go after China on human rights issues if the CCP does not reform its unfair trade practices. What we said To ensure that China implements its economic reforms and consolidate the results of the trade talks, the Trump administration may make high-profile moves to spotlight the CCP’s human rights violations. U.S. Secretary of State Mike Pompeo announces that the State Department will hold its first-ever ministerial to advance religious freedom on July 25 and July 26. The CCP could continue to accelerate China’s economic opening up to attract foreign investments and resolve its capital outflow issues. On the flipside, the CCP could abandon reforms, gradually close up China, and move to strengthen its “stability maintenance” efforts if it encounters extreme confrontations from the populace. As the CCP is pushed to the limit by the trade war, it would seek to engender and escalate conflict in other spheres to make life difficult for America.For instance, the CCP could increase military operations near Taiwan or in the South China Sea. President Donald Trump announces that the U.S. will impose 25% tariffs on $50 billion worth of Chinese goods. U.S. National Security Advisor John Bolton warns of China election interference. President Trump announces 10% tariffs on an additional $200 billion worth of Chinese products. The tariff rate is set to rise to 25% in 2019. The USS Decatur and Chinese warship Lanzhou have a near-collision incident in the South China Sea. What we said As bilateral tensions heat up, the U.S. could step up sanctions against government departments and individual officials in the Chinese regime in a similar manner to the handling of the Central Military Commission EDD and the PLA lieutenant general Li Shangfu. For instance, the United Front Work Department, the CCP propaganda apparatus, the CCP regime’s intelligence apparatus, as well as their respective officials could see their U.S. assets frozen, be denied visas, and be banned from participating in the U.S. financial system. Targeted sanctions would severely weaken the overseas operations of the aforementioned CCP organs, and impede their ability to counter U.S. national and geopolitical strategy. According to Reuters, the U.S. Commerce Department is looking to restrict exports of U.S. technology that can be used in the surveillance and internment of Xinjiang Muslims to China. Vice President Mike Pence gives a major policy speech on China where he also warned of China election meddling. A bipartisan group of U.S. Senators introduces a resolution condemning violence against religious minorities in China and reaffirming America’s commitment to promote religious freedom and tolerance around the world. Secretary Pompeo designates China and nine other countries as Countries of Particular Concern under the International Religious Freedom Act of 1998 for having engaged in or tolerated "systematic, ongoing, [and] egregious violations of religious freedom." 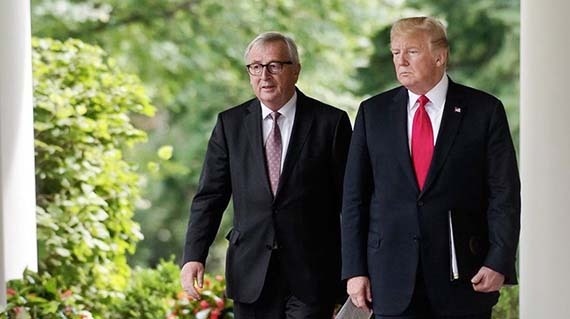 July 26, 2018 – President Donald Trump and European Commission president Jean-Claude Juncker announced a new U.S.-EU trade agreement. Trump seems to be reshaping a post-WWII world order that has been hijacked by the CCP. What we said We believe that Trump no longer wants America to be part of the CCP-hijacked world order and is seeking to build a new rules-based, reciprocal global trading system. Such a system could later become the foundation of a new intergovernmental organization, should there be a need. The new U.S.-led world order, when established, would almost certainly isolate the PRC and become the final nail in the coffin for the CCP, which is currently facing intractable economic and social problems on the mainland. President Trump and South Korea's Moon Jae-in sign a revised United States–Korea Free Trade Agreement at the sidelines of the United Nations General Assembly in New York. America, Mexico, and Canada negotiate a U.S.-Mexico-Canada Agreement to replace the North American Free Trade Agreement. The USMCA has a clause that allows agreement partners to quit in six months if any partner enters a free-trade agreement with a "non-market" country. The Trump administration announces that it would seek separate trade agreement talks with Japan, the European Union and the United Kingdom. The White House announces that it is beginning the year-long process to withdraw the U.S. from the Universal Postal Union. In a speech entitled, “Restoring the Role of the Nation-State in the Liberal International Order,” U.S. Secretary of State Mike Pompeo said that America is “rallying the noble nations to build a new liberal order that prevents war and achieves greater prosperity.” Pompeo said that “China’s economic development did not lead to an embrace of democracy and regional stability; it led to more political repression and regional provocations.” He added that countries like Iran and China are “undermining the international order. 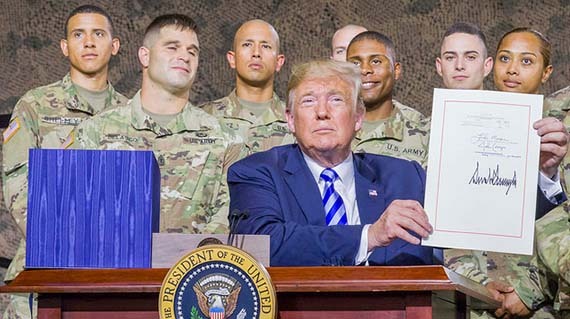 In August, the United States passes the 2019 National Defense Authorization Act. 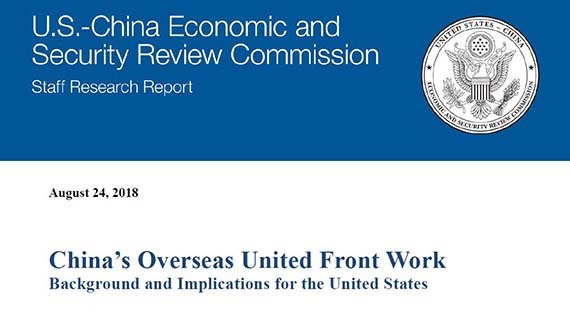 On August 24th, the US-China Economic and Security Review Commission publishes a report on the united front work of the Communist Party of China and its challenges to the United States. To counter CCP influence operations, the Trump administration could confront China on the ideological level. What we said If the U.S. continues to draw attention to CCP influence operations and takes active steps to counter CCP propaganda, then America would have taken its “strategic competition” with the PRC to the ideological level. And unlike a trade conflict, ideological clashes cannot be resolved through negotiation but through zero-sum competition. What we said We believe that the CCP has ultimately misread the shifting mood against its pernicious behavior in America and the unity of the U.S. political elite on the China issue to its disadvantage. Still, CCP propaganda mischief, when prolonged and intensified, could potentially leave a lasting and very damaging impression of the Trump administration and America at home and abroad (think accusations of “racial McCarthyism”). William Evanina, the director of the U.S. National Counterintelligence and Security Center, said in an interview with CBS that China is "existentially, long term, they're the largest threat to our national security, bar none – it's not even close." He added, "they bring ungodly resources that we can't handle right now." FBI director Christopher Wray told CBS: "If I look at our counterintelligence mission overall, China is our top priority in that space." President Trump said at the United Nations General Assembly: "Virtually everywhere socialism or communism has been tried, it has produced suffering, corruption, and decay. Socialism's thirst for power leads to expansion, incursion, and oppression. All nations of the world should resist socialism and the misery that it brings to everyone." What we said Spread GEPP messaging and narratives among the U.S. business, media, and intellectual elites with the goal of undermining confidence in the Trump administration’s policies on China. Such messaging could include hijacking the “new Cold War” narrative; claiming that the Sino-U.S. trade war would lead to economic crisis, global instability, and even a hot war; and promoting the idea that the Trump administration is paranoid, xenophobic, and Sinophobic. President Trump said at a UN Security Council meeting: "Regrettably, we found that China has been attempting to interfere in our upcoming 2018 election coming up in November against my administration. They do not want me, or us, to win because I am the first President ever to challenge China on trade. And we are winning on trade. We are winning at every level. We don’t want them to meddle or interfere in our upcoming election." US Vice President Mike Pence delivers a major policy speech on China at the Hudson Institute. Pence touched on the historical evolution of U.S.-China relations, as well as the CCP's long-term espionage, influence, and interference activities in the United States. We have been able to accurately read and anticipate developments in Sino-U.S. relations partly because we have a deep understanding of CCP elite politics and its operations. To paraphrase Sun Tzu, knowing the enemy is at least half the battle won. The U.S. Council of Economic Advisers releases a report outlining the opportunity costs of socialism on the macro economy. The report looks at Maoist China, Cuba, and the USSR for examples of the most highly socialist cases, and also examines the situation in the Nordic countries and Venezuela. The State Department's Global Engagement Center announces a new effort to counter propaganda and disinformation campaigns from rogue nations like China, Russia, and Iran. The CCP’s approach to the Sino-U.S. trade conflict suggests that it is misreading the shift in U.S. policy on China. What we said We believe that the CCP’s response to America’s China policy revolution is either a serious misreading of the situation or a gamble on changes in domestic U.S. politics at the midterm elections creating favorable conditions for the PRC to renegotiate trade with America. Either strategy reflects the limits of what Xi Jinping can do within the CCP system, and would create fresh complications for both China and the U.S. going forward. Chinese think-tanks passes on “filtered information” to policy makers to avoid offending superiors, according to the South China Morning Post.